Our biggest passion is passing along the love of music. We believe that the best teachers know how to be relevant to their students and balance this with giving them what they need. This is why we use a three pillared approach. This approach allows us to maximize fun, learning, and go in the proper direction. 1. We want to know what your goals are and what playing music means to you. This helps us to get an idea of how to structure your lesson and how to systematically help you move towards your goals and beyond. We find that our students tend to blow past their original goals and achieve way beyond their expectations. ​2. We want to teach you the proper way to play, while helping you to develop your own style. Unlike the corporate song-cramming lesson houses, we teach way more than just songs. We want our students to actually be able to play their instrument on a high level and know why they are playing what they are playing. We are happy to show you how the best musicians in the industry play while also helping you to develop your own style. 3. We make sure our lessons are the perfect balance of instruction and fun. We teach our students their favorite songs. We help our students make videos to show their friends. We talk about music's past, present and future so our students can appreciate the music on a deeper level. Learning drums is serious, but its also fun. Our biggest passion is passing along the love for music. Sam grew up in a musical family and decided he wanted to take piano lessons at the young age of 6 years old. After his first recital performance Sam began to lose interest in piano. He decided he wasn't good at piano and begged his mother to let him quit. His teacher kept telling him that he needed to practice, but when he sat down at the piano his assignments seemed like an insurmountable mountain. After of dozens of heart to heart discussions, Sam's mother let him quit. Sam was a victim of poor music teaching practices and these poor teaching practices almost cost him his love for music. Here is how Sam's passion for music was saved: Sam's sister and father were both drummers. After being exposed to his family's enthusiasm for music and seeing a wide variety of performances, Sam decided to give musicianship another go. He joined his school band as a brass player and he started learning drum set on a hand-me-down drum kit from his sister. When Sam was fourteen, a couple of friends asked him to join their pop/rock band. From then on, Sam's performing career had begun. Joining that band was some of the most fun Sam had ever had. Before he knew it, Sam was in High School and playing shows at VFW halls, Church Basements, Pool Halls and Festivals. He loved the music, the shows, and all of the interesting people he was meeting on the way. Eventually Sam was approached by some friends to start teaching them how to play drums. Sam was so excited to show his friends what he loved. He found he was a natural teacher. He found it was a fun challenge to figure out how his students learn best and help them improve quickly. Fast forward to today, Sam is a college educated, road tested, professional teacher and drummer. He has studied with some of the best players in the industry on drums, brass, and piano. Sam has a keen sense of what students need and when they need it. Sam has shared the stage with Jay Leno, Rodney Atkins, Switchfoot, Bernard Purdie and countless others. Sam has ironed out a 3 pillared approach for his own teaching and for his other teachers that can be read about in detail above. Contact us today to schedule a free trial lesson with Sam. "Sam is such a amazing teacher! I started off having never played drums in my life and he already has me playing full songs and reading music. Sam is so patient and shapes the lessons to what you are looking to get out if it. His lessons are a blast and I look forward to them every week! Would recommend his lessons to anyone!" Brendan is a drum instructor who specializes in Jazz, Pop/Rock, Funk, and Hip Hop. Brendan has been playing the drums for the majority of his life and is dedicated to passing along his knowledge and love for music to students young and old alike. Brendan grew up in Philadelphia where he was exposed to a diverse montage of different types of music and cultures that have shaped his approach to music and teaching. After high school, Brendan attended the College of William Mary in Williamsburg, Virginia where he quickly developed a reputation among peers and faculty for his musicality and dependability. 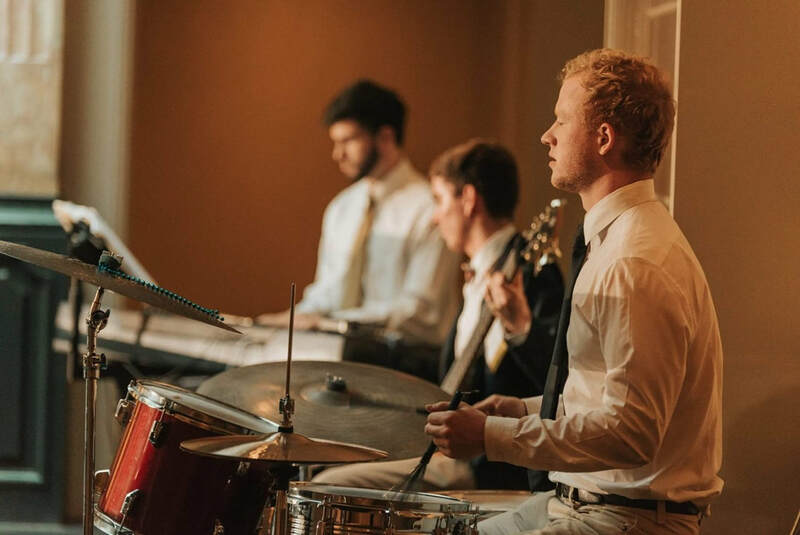 Brendan represented his Alma Mater as he toured the country playing drums for William and Mary's token jazz combo. After graduating Brendan moved to Chicago to take his musical career to the next level. In addition to teaching at Sam's Lessons, Brendan teaches group music classes on the northside and manages/plays drums for his band. When Brendan isn't teaching or playing drums he can be found having a conversation in fluent French, reading a book, seeing a comic or audio engineering.